The Model 452, and the Model 452-D Trac Vacs are two more vacuums in Midwest Equipment Mfg's full line of lawn vacuum systems. The Model 452 is designed to fit standard lawn and garden tractors without any special hitching mechanism. A chain lock system does not allow vacuum to pivot to the right or left once attached, making the vacuum act like an extension of the frame on the tractor. The Model 452-D is designed to fit mid-mount zero turn radius mowers, with the appropriate hitch. The hitch allows vac to pivot up and down but not side to side, making the vacuum act like an extension of the mowers frame. Both units are fully castered for easy handling around trees, shrubbery, driveways and other obstacles. The 44 gallon Rubbermaid Brute container is easily removed for quick dumping anywhere: trash pile, pick-up truck, or composter. A 6.5HP Briggs and Stratton Intek I/C engine powers the air turbine for maximum air flow and pickup efficiency of grass clippings, leaves and light litter from mower discharge. The engine features throttle control, stop switch, ball bearing on the PTO side, electronic ignition, oil dipstick and durable low-tone muffler. Optional engines include the Briggs and Stratton 6.5 HP Intek Pro, Kohler CS 6HP, and Honda 5.5HP, engines. The spring loaded top assembly lifts quickly out of the way with a minimum of effort. The directionally-louvered top keeps the air discharge away from the operator. A plastic bag can be used inside the container allowing you to bag grass clippings and leaves. 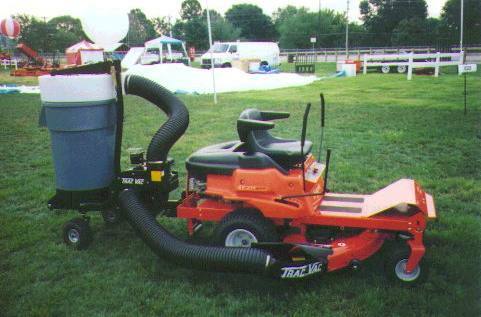 The versatile Model 452 or Model 452-D Trac-Vacs are quick, quiet and clean to operate.